Is your house or business cluttered with unwanted items? Then consider calling a waste removal service like Geppert Recycling. A family owned and operated “full service” waste disposal company with over 20 years serving the greater Philadelphia tri-state area since 1992. 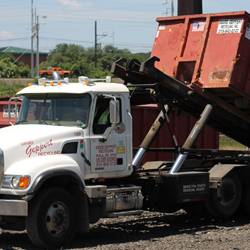 Geppert has the equipment and manpower to handle junk removal jobs large and small. Geppert will delivery a dumpster rental from our fully-equipped roll off trucks in one of the following sizes (depending on the size of your proejct): 6, 10, 15, 20, 30 and 40 cubic yards. We offer service within 24 hours and employ only experienced drivers. We service all types of projects from yard cleanups, home remodeling, to the largest construction projects. Geppert also offers specialty demolition for hard to remove items like oil tank removal and boiler removal. Call Geppert today to speak with one of our helpful representatives to see how we can help you with that difficult or unique project. No project is too big or too small, so call us today. Geppert Recycling offers personalized and dependable service coupled with competitive pricing and the best customer service to handle all of your waste and recycling requirements. Our sales staff is ready to help you determine the best options for your waste handling needs. Contact us today for a free quote. We offer 10 ,15, 20 ,30 and 40 yard Dumpsters and service the Montgomery County, Delaware County, Chester County, Bucks County and Philadelphia area. Please call for Free Quote. We offer the most reasonable and fastest service in the area.